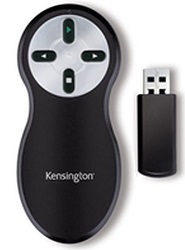 The Kensington Presenter Remote Wireless Remote lets you remain in control of your The Kensington Wireless Presenter lets you remain in control of your presentation from up to 65 feet away. Conveniently portable and easy-to-use, it frees you from distractions and lets you focus on what really matters - your audience. Windows 7, Vista, XP, Mac OS & Lion OS Compatible.